Right here, my own home where I can put anything I want. Most significantly contains over 200 reviews for TI calculator programs. Providing the cleanest site for song lyrics. Huge amount of texts in several languages. Helpful pages, in particular an interactive overview of keyboard functionality of the vi/vim text editor. Detailed database of my ancestors and related branches. Access is restricted to family members for now. Contact me if you are. See my CPAN page for now. More coming later. The ultimate Nibbles: 256 directions (free movement! ), custom levels, several multiplayer modes for upto four players! Great shoot'm'up with nice graphics, fast gameplay and various upgrades. A playable tunnel game at just 104 bytes! 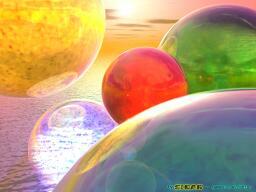 Cool pictures with colorful reflecting spheres. Some old (mostly) games I wrote for DOS. Mostly an overview for historic purposes; not really programs worth downloading nowadays.